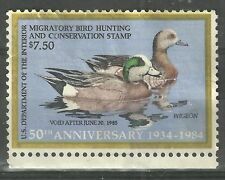 US RW16, 1949 Duck stamp. Stamp Condition photos are of the exact stamp you will receive. Mint Never Hinged / Full Gum / No Creases. RW71 - RW80 (2004-2013). RW61 - RW70 (1994-2003). RW51 - RW60 (1984-1993). RW41 - RW50 (1974-1983). 1985 WISCONSIN DUCK STAMP & Print by Greg Alexander Framed #'d 1250. Print is signed and numbered 1052/1250 by the artist.Frame has a few knicks and scratches from storage.Buyer to send payment within 2 days and include $15.00 for shipping. Shipped with USPS Priority Mail.Thanks for bidding. RW71 - RW80 (2004-2013). 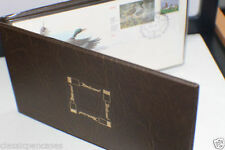 Stamp Condition photos are of the exact stamp you will receive. Mint Never Hinged / Full Gum / No Creases. RW61 - RW70 (1994-2003). RW51 - RW60 (1984-1993). RW41 - RW50 (1974-1983). 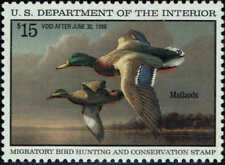 US RW47, 1980 Duck stamp. # RW 4 VFOG/SE.Partial gum which is DG. Stamp Condition photos are of the exact stamp you will receive. 90 (2014-2023). RW71 - RW80 (2004-2013). RW61 - RW70 (1994-2003). RW51 - RW60 (1984-1993). RW41 - RW50 (1974-1983). RW31 - RW40 (1964-1973). RW36-1969 Federal Duck stamp-mint, with centering & margins as shown in the scan. Free combined S/H on all lots! 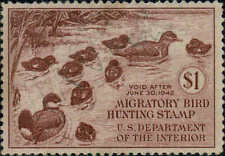 Migratory Bird Hunting Stamp. - Wood Duck. - Void After June 30, 1975. - Mint Condition. 1960 NH Trout Stamp. Shipped with USPS First Class Package. Scott RW-76.Long-tailed Duck. W/ Certificate of Appreciation. Mint,never hinged. Scott RW76. Long-Tailed Duck. US Federal Duck Stamp. RW76 Duck Stamp, plus Certificate of Appreciation. Stamp mounts are NOT included. US Scott # RW6 UNUSED / VF. 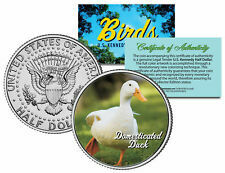 FEDERAL DUCK STAMP. AUTOMATICALLY DEDUCTED AT CHECKOUT! Free combined S/H on all lots! I will do my best to solve the problem. 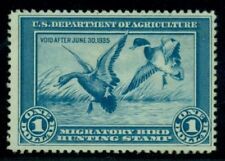 US RW19, 1952 Duck stamp. US RW22, 1955 Duck stamp. There is a crease. High catalog value! Area of missing gum (see photos). photos are of the exact stamp you will receive. Stamp Condition RW71 - RW80 (2004-2013). RW61 - RW70 (1994-2003). RW51 - RW60 (1984-1993). RW41 - RW50 (1974-1983). Mint No Gum / Unsigned. 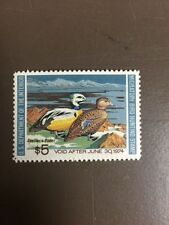 US RW32, 1965 Duck stamp.